The sinuses are physically close to the brain, the eye, and major arteries, always areas of concern when a fiber optic tube is inserted into the sinus region. The growing use of a new technology, image guided endoscopic surgery, is alleviating that concern. 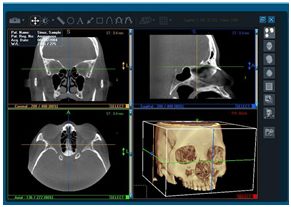 Image guidance is a near-three-dimensional mapping system that combines computed tomography (CT) scans and real-time information about the exact position of surgical instruments using infrared signals. In this way, surgeons can navigate their surgical instruments through complex sinus passages and provide surgical relief more precisely. Image guidance uses some of the same stealth principles used by the United States armed forces to guide bombs to their target. FESS procedures that are performed in conjunction with navigation solutions are highly effective treatment strategies for complicated acute sinusitis and chronic sinusitis. Extraordinarily accurate results in the navigation of tumors and lesions affecting the anterior and lateral skull base, including cholesteatoma, petrous apex tumors and pituitary tumors. Our navigation solutions provide the ability to navigate on images with more clearly defined lesion borders, allowing the removal of diseased tissue without disturbing the surrounding healthy anatomy.